↑ मेरिल, रोनाल्ड टी॰; मैकल्हिनी, माइकल डब्लू॰; मैकफेडेन, फिलिप एल॰ (1996). "अध्याय 8". The magnetic field of the earth: paleomagnetism, the core, and the deep mantle. एकेडमिक प्रेस. आई॰ऍस॰बी॰ऍन॰ 978-0-12-491246-5. ↑ वेई-हास, माया (4 फरवरी 2019). "Magnetic north just changed. Here's what that means". Science & Innovation. नेशनल जिओग्रैफ़िक. अभिगमन तिथि 5 फरवरी 2019. ↑ अ आ World Data Center for Geomagnetism, Kyoto. "Magnetic North, Geomagnetic and Magnetic Poles". अभिगमन तिथि 2012-07-03. ↑ Press, Associated (5 February 2019). "Polar express: magnetic north pole moving 'pretty fast' towards Russia" – वाया www.theguardian.com. 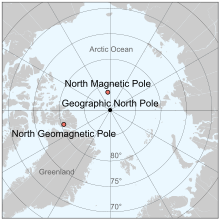 ↑ "The Magnetic North Pole". Ocean bottom magnetology laboratory. Woods Hole Oceanographic Institution. अभिगमन तिथि 2017-02-06. "Wandering of the geomagnetic poles". Geomagnetism. National Geophysical Data Center. अभिगमन तिथि 19 April 2012. "Geomagnetism". Natural Resources Canada. April 1, 2012. अभिगमन तिथि 19 April 2012. "North Magnetic Pole could be leaving Canada". CNN.com. 20 March 2002. अभिगमन तिथि 19 April 2012. "Magnetic pole drifting fast". BBC News. 12 December 2005. अभिगमन तिथि 19 April 2012.